I've always been a fan of hummus; I love the creamy chickpeas and the nutty sesame flavor. It's easy to make, and works well on sandwiches and as an afternoon snack with veggies and crackers. I've taken to adding a bit of smoky lapsang souchong to my hummus, to change up the flavor and add a nice smoky note. When I was at the grocery store other day I noticed a roasted beet hummus on the shelf. At first I thought it was a strange idea, but then I thought about how the earthy and sweet beets must compliment the smooth chickpeas quite nicely. As I waited in the checkout line, I started thinking about beet hummus (as one does), and realized it would go really well with some added lapsang! So, I created my own. It may sound a bit out of the ordinary, but I assure you it's quite delicious. First, roast the beet- Preheat the oven to 450º. Wash the beet, but don't peel it. Poke a few holes in it, then wrap in tin foil. Roast for about an hour- testing after 45 minutes for doneness. A knife should easily side into the beet when it's ready. Remove from oven and let it cool slightly, still wrapped in the tin foil. When the beet is cool enough to handle, peel off the skin. I like to use paper towels for this, as your hands will get instantly red if you use your fingers! To grind the tea, you can use a mortar and pestle, spice grinder, or just a small bowl and the back of a wooden spoon. Make sure the bits are nice and small, as they will incorporate better into the hummus. 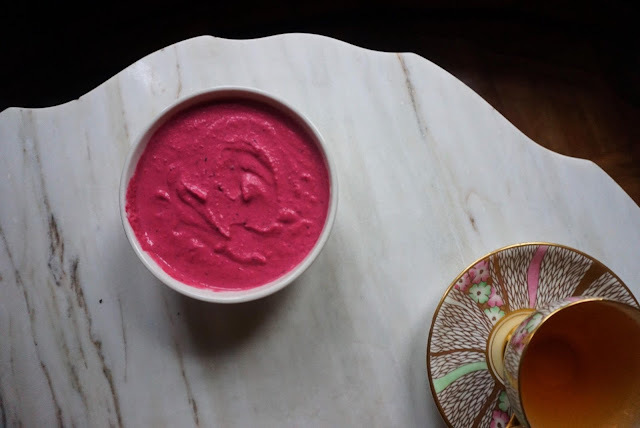 Assemble the hummus- Once the beet is cool, slice and add to a food processor, along with the remaining ingredients except for the reserved chickpea liquid. Blend the mixture until it's nice and smooth. Taste, and add more lemon juice if desired. I actually like the consistency of the hummus as it is at this stage, but if you'd like to have a thinner hummus, pour in about 1/4 cup or so of the reserved chickpea liquid in while the food processor is running. Transfer to a bowl and serve your gorgeously pink hummus with crackers, veggies, whatever you like! I think this vibrant hummus really brightens up the gray winter days we've been experiencing lately. 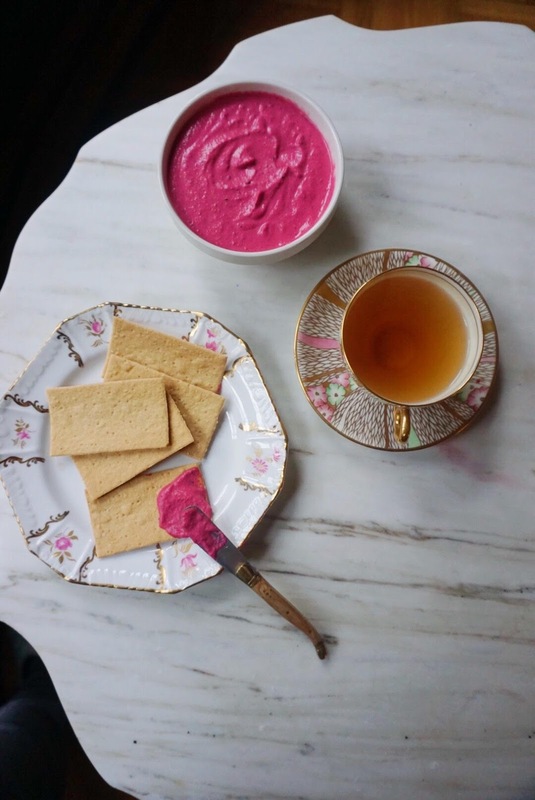 You can pair the hummus with any kind of tea, but I prefer a hearty assam, or a sweet hong cha. You'll want something that can stand up to the smoke, but I wouldn't recommend a smoky tea, as it's a bit too much. Whatever you pair it with, I hope you enjoy! Great idea! I love hummus, and I love beets. I've been tempted to buy the beet hummus at Whole Foods but never have. I like your incorporation of tea, Sara. What I really like though is the tea ware you use in these photos. Beautiful! I made this the day before yesterday and it is wonderful!!! What a creative recipe!